Gladiators! We are so excited to welcome you back to our third season. We’ve got twenty-two brand new episodes to present to you this season, jam-packed with drama, lots of gladiating, and of course, a few good old-fashioned scandals. As the show has been growing and gaining new eyes, Shonda and the writers have had their eyes on fresh sources of inspiration. One of the new and exciting things we’re proud to showcase this season is a new style of still photographs (actually, if you watch, they move!). If you know Scandal, you know we love our “click! click! click!” photo snaps that weave the episodes together. These represent the constant media scrutiny that frames every scandal, as well as the close eye on the details that any crisis manager worth her salt must have. For season three, the writers and I immersed ourselves in the photographs of White House official photographers past and present. Almost every modern president has employed an official photographer, there to capture behind-the-scenes moments – the highs and the lows, the mundane and the extraordinary. These photographers have made famous images: Betty Ford dancing on the Cabinet Room table (by photographer David Hume Kennerly); Lyndon Johnson being sworn in as President aboard Air Force One soon after JFK’s assassination (Cecil Stoughton); Clinton exploding with rage in front of George Stephanopoulos (Bob McNeely); and Obama stealing a sweet smile with Michelle (Pete Souza). Of course, in the pictures that opened our show, there weren’t any sweet smiles to feature. Season three opens right where we left off, on the drama of Olivia’s name just having been leaked. We see a tense Cyrus whispering to Fitz as the news breaks, Cyrus tossing a newspaper with dramatic headlines aside, staffers swirling around televisions featuring breaking news, and Mellie taking a private chocolate break to deal with the stress. 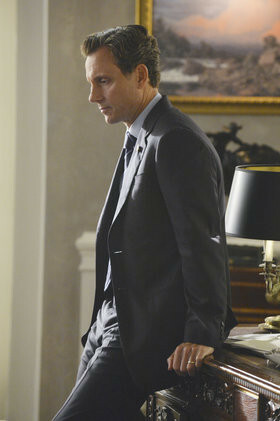 So, what photo-worthy events will go down in Scandal history this season? Will Olivia’s father continue to wreak havoc on her life? Will Fitz’s attempt to play nice with Sally succeed? And will Olivia succeed in trying to lead “business as usual” in the midst of the media firestorm that surrounds the leaking of her name? Stay tuned to find out! For more info about White House photographers, check out The President’s Photographer by John Bredar with a foreward by Pete Souza, published 2010 by The National Geographic Society.